Marty Lyons was a professional football player in the National Football League, where he served for twelve years as a premiere defensive lineman for the New York Jets. Early in his career, Marty befriended and became a surrogate father to a three-year-old boy suffering from an advanced illness. Three years later, in the spring of 1982, the youngster's death coincided with the sudden death of Marty's father and the birth of his first child, a healthy son. These experiences profoundly affected Marty's attitude toward life, fame and his fellow human beings. With the encouragement and assistance of family and friends, Marty Lyons became determined to establish a foundation dedicated to granting wishes of seriously ill children. The Marty Lyons Foundation has kept hope alive in the hearts of children with a terminal or life threatening illness by making their special wish come true! A fulfilled special wish has the ability to sweep the children and their family away from the daily heartache of illness. It is a joyous time that creates a wonderful memory and a better quality of life. Every child has a dream, and although we can't promise a lifetime of happiness to these seriously ill children, we can make one dream a reality! We have granted wishes for a special trip to Disney, meet a celebrity, a computer system, a swimming pool filled with spring water, a shopping spree, and special renovations to allow a child to live at home with family, swim with dolphins, a Cinderella-like "Sweet 16" birthday party and so many more. Through the Louis J. Acompora Memorial Foundation, John and Karen Acompora created and distributed some 5,000 kits with printed information, a CD-ROM and a video about AEDs and sudden cardiac arrest. And Karen Acompora has traveled throughout the country and to Canada to push for AEDs in schools. The efforts led to passage of a law requiring AEDs in schools throughout New York state. School districts in states including California, Florida, Illinois, Iowa, Pennsylvania and Washington also have brought AEDs into schools. And a bill signed into law last spring authorizes $30 million in federal grants to states and localities for the purchase and placement of AEDs in public places. The move to bring AEDs into schools reflects a growing awareness about sudden cardiac arrest and use of the devices to treat it. Sudden cardiac arrest that occurs outside of hospitals causes some 250,000 deaths annually, the American Heart Association (AHA) says. The Nassau County PAL has joined forces with the Louis J. Acompora Foundation in placing over 120 AEDs on our fields, thereby keeping a safe enivoronment in which all children can play. We are proud to name John and Karen Acompora as our first two original Honorary Members. His career began when he was drafted in the sixth round of the National Football league in1978. He went on to start in 16 out of 16 games as cornerback his rookie year. He tied for the team lead with 5 interceptions. He was also named to the “AFC All-Rookie Team” as a starter.Bobby was named defensive captain in the 1981 season. Bobby also led the team in interceptions 3 other times. He scored 2 touchdowns in the game against the Vikings, one on an interception and another on a fumble return; one touchdown was 77 yards and the other was 80 yards respectively. He received 5 game balls in that game against the Vikings, not only defensive but accomplishing offensive as well. He was named “All Pro” by Pro Football Weekly Magazine. 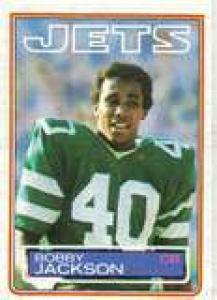 Bobby was selected to the “All-Time Jet Team” as one of the top three corners in the history of The New York Jets. He had a total of 21 career interceptions. Bobby hails from Florida State University where he was inducted into the FSU hall of fame in 1993. He once held the all time interception record at FSU, broken by Terrell Buckley. Bobby also held the single game punt return average of 45.3 yard per carry (minimum three returns) since broken by his own NY Jet’s Leon Washington only 3 years ago. Bobby has enjoyed helping to develop the professional aspirations of his two sons. The older was drafted by the San Francisco 49’ers and the younger is currently seeking his place in professional football. Nick Evlampios Fotiu was tough as nails. As a son of a Greek father and Italian mother he had the temperament in his blood. When Nick grew up in Staten Island he used to take the 3½ hour journey to Skateland, which was an ice rink in New Hyde Park. The trip required two buses and two subways so it wasn't unusual that Nick stayed there until they closed. Years later Nick reflected back on those times. "Sometimes I'd find myself on the subway in the middle of the night and I'd say to myself, ' Am I nuts or what ? Is this all worth it ? I'd be up at 3 AM, and getting home at 9 AM because it was often easier to get ice between 5 AM and 7 AM - so just when people were first getting up, I'd be coming home from the rink, dropping of my gear, and going to work. " Nick said. And when the Rangers practiced at Skateland, Nick was around to carry the players sticks and telling them that he one day would make it to the big league. Nick could very well have become a professional boxer. He was very strong and went on to become the Police Athletic League Boxing Champion and surely could have had a future as a pro boxer. His boxing skills was something that many players experienced in the hockey rink throughout the years. Not many wanted to fight Nick for obvious reasons. Nick never saw himself as a goon though. "I'm no goon. I play hockey. I check. If anybody wants to fight, I'll fight." Nick once said. Not that many people really wanted to fight him. Dave "The Hammer" Schultz, one of hockey's most infamous tough guys, wrote in his book that Fotiu was the only man he was afraid to fight in his NHL career. 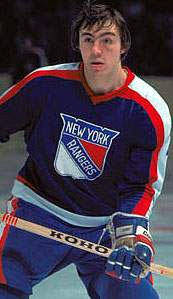 Nick started playing competitive hockey in 1971 for the New Hyde Park Arrows in the NY Rangers sponsored Metropolitan Junior Hockey Association. He then went on to play for the Cape Cod Cubs in the (NAHL) where he in his first year picked up a league high 371 Pim's. In June 1974 the New England Whalers (WHA) signed him as a free agent. Nick played two seasons for the Whalers before he was signed by the NY Rangers on July 1976. Nick became an instant hit in the Big Apple as the crowd embraced their "local kid." Nick was after all a native New Yorker who had lived in NY all his life (he attended New Dorp High School). It has always incorrectly been said that Nick was the first native New Yorker ever to play for a New York team, which isn't quite true. Billy Burch, born in Yonkers, NY used to play for the NY Americans back in the 1920's and 30's. After three seasons in New York, Nick was claimed by the Hartford Whalers in the 1979 expansion draft. The NY management weren't happy to see Nick go to Hartford so they re-acquired Nick in 1981. During his second stint in NY he became even more popular. One of the most appreciated things among the fans was when Nick tossed pucks up to the crowd after pre-game warm-ups. This became a ritual before every home game. Nick won the Rangers Fan Club award (Frank Boucher Trophy), given to the most popular player on and off the ice. He won it in 1982 and 1984. Unfortunately his time in NY had to come to an end. On March 11, 1986 he was traded to Calgary. Nick went on to play for Philadelphia and Edmonton as well shortly thereafter. Nick retired after the 1989-90 season, shortly before his 38th birthday. Nick wasn't a very technical player but had a pretty decent shot and was a pretty fair skater as well. He didn't excel in any of these departments, but he was a fierce competitor who always played hard and who was willing to lay out heavy hits as well as drop the gloves. Nick, who probably has the NHL's best middle name - Evlampios - retired with 646 NHL games under his belt. He scored 60 goals and 137 points in that time, as well as picking up 1362 PIM. He also played 110 games in the WHA, scoring 5 goals and 9 points plus 238 PIM. (born July 2, 1970) is a former Americanathlete, winner of 400 mhurdles at the 1996 Summer Olympics. Born in Brooklyn, New York, attended Malverne High School, Derrick Adkins rose into the international athletics scene in 1991, when he finished third at the US National Championships and qualified to the 1991 World Championships, where he finished in the sixth place. 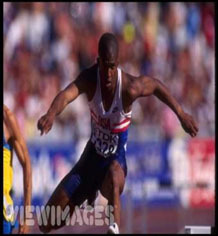 Adkins won the World Student Games in 1991 and 1993 and finished seventh at the 1993 World Championships. Adkins made a rapid improvement in 1994, when he won his first US National Championships. He repeated this win in the next year and at the 1995 World Championshipshe was already a main favourite to the gold medal. At Gothenburg, Adkins won his heat easily and in the final he won the gold narrowly ahead of his career long rival Samuel Matetefrom Zambia. Prior to the AtlantaOlympics, Matete beat Adkins in four races out of five, but at the Olympic Gamesitself Adkins turned the tables on Matete, winning in a time of 47.54 and beating Matete to a second place by 0.24 seconds. In 1997, Adkins was second at the US National Championships, but missed the final for the first time at a World Championships by finishing only fifth at the semi-final. Adkins was Assistant Coach of Columbia University's Track and Field team between 2004 and 2006. On February 17Adkins appeared on The Late Show with David Lettermanshowing his gold medal on "Show and Tell". (born May 8, 1978, in Hempstead, New York) is an Americanprofessional basketballplayer with the NBA's Atlanta Hawks. Prior to the NBA, Claxton played at Hofstra University, where he played under current Villanova Universitycoach Jay Wright. At Hofstra, Claxton led the Pride to the America East Championship defeating the University of Delawarein the championship game at Hofstra Arena. The Flying Dutchmen (they did not become The Pride until 2005) reached the 2000 NCAA Tournament, where they were defeated in the first round by an Oklahoma Stateteam led by Desmond Mason, Claxton's future teammate with the Hornets. He donated money to help build the arena in which the Hofstra team plays. Claxton was drafted in 200020th overall, by the Philadelphia 76ers.His rookie scale contract was worth four years and $4.68 million; he opted out of the fourth year to become a free agent. He missed his entire rookie season due to a knee injury suffered during the pre-season. In 2002 Claxton was traded to the San Antonio Spurs, where he won the 2003 Championship as a valuable reserve backing up Tony Parker. In 2003 Claxton was signed by the Golden State Warriorsto a three-year contract worth US$10 million. On February 24, 2005, Speedy and Dale Daviswere traded from the Warriors to the New Orleans Hornets for Baron Davis. On July 12, 2006, Claxton signed a contract worth approximately $25 million over four years with the Atlanta Hawks. Speedy has only played 42 games with the Hawks, as he has been injured in every year since he signed with the team. Claxton's parents are from Antigua and Barbuda. His sister, Lisa, is currently in her second season as a point guard for the nationally ranked St. John's Red Storm women's basketball team. His brother Michael (M. Buckets) played college basketballfor the Villanova Wildcats. Well…if you own a TV…you’re probably aware of Fitness Celebrity John Basedow and his ubiquitous commercials for the best-selling Fitness Made Simplevideo series, which has helped to improve the bodies and lives of thousands of men and women. From starting out in his parent’s basement to being seen on television sets across the country and deemed a "pop culture icon" by the media, John's journey is an American dream come true "rags to riches" story. Fueled by an undying persistence and his personal motto “believe in yourself and you can accomplish anything”, John has achieved international recognition and created a media empire with Fitness Made Simple, which includes DVD's, CD’s, supplements, and infomercials all aimed at raising awareness about the importance of making fitness a part of your life. He’s been featured on numerous TV and radio shows as well as in print media ranging from The Los Angeles Times to The National Examiner. In fact, The New York Times places him alongside NASCAR and figure skating in the contemporary pantheon of “great American sports television phenomena” and Muscle & Fitness Magazine named him the top infomercial star of the past 20 years. In addition to being a model that's graced the pages of just about every major exercise magazine, John's also a widely respected columnist whose written articles for over a dozen publications. He's a regular guest on radio programs across the United States and stars in a new reality series, John Basedow TV, which is based on his life. Building on his nationwide popularity, John Basedow TVis a "feel good" show that delivers John's positive message for your body and mind…in a creative, engaging way with a rare mix of inspirational and comedic elements. John’s first book, Fitness Made Simple: The Power To Change Your Body & Life, hit the market in late 2007. Published by literary powerhouse McGraw-Hill, this book highlights John’s complete exercise and nutrition program, which provides an exact blueprint for attaining your ultimate physique, along with details of his own personal success story. John is a spokesman for the American Heart Association and even led their annual Heart Walk for the past two years. He also works with various other charities, including the American Diabetes Association, and motivates people of all ages, from teenagers to grandparents, to follow their dreams with his popular Power To Change Your Body and Life Seminars. As John says, "If you can think it, you can do it. Don't listen to negative people. If you focus on your goals, work hard, and never quit, you can acheive anything." Coming from the mean streets of Los Angeles at Crenshaw High School, Darryl Strawberry quickly found himself the toast of New York after finding early success with the Mets, including winning the Rookie of the Year award in 1983. Though it is reported that Darryl didn't like the pressure of being the chosen boy in The Big Apple, he played the part fast and hard. It wasn't long before Darryl would lead this team to the promised land of the 1986 World Series. Despite what the critics said he out performed himself year after year. From 1984 to 1991 Darryl Strawberry was voted to the National League All-Star team. Posting the most impressive numbers in Mets history made Darryl Strawberry one of the most popular athletes in the world. Strawberry went back to his hometown in 1991 after signing a free-agent contract with the Los Angeles Dodgers. However, even after traveling across the country, Darryl's personal problems continued to chase him. He was plagued with injuries and his battle with drug addiction. But as his life has proven you can never force a champion to quit; this was indeed Darryl's mantra. Darryl signed with the New York Yankees in 1995, complete with George Steinbrenner vowing to keep a watchful eye on his new slugger. Steinbrenner's faith in Darryl paid off immediately. The Yankees won the 1996 World Series with Darryl front and center. He proved his value every year, but during the 1998 season Darryl was diagnosed with colon cancer. Watching from his hospital room at Columbus Presbyterian the Yankees dedicated each and every game to the recovery of Darryl Strawberry as they won the 1998 World Series. 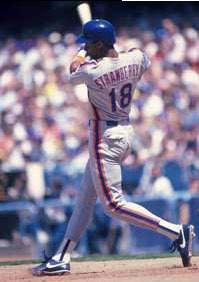 Darryl Strawberry burst into national consciousness as a 21-year-old rookie with the sweetest swing in recent history. Regretfully remembered for the unlimited potential that may have been, Darryl has returned to the spotlight a changed man with new goals. His foundation focuses on helping others as Strawberry's latest ventures have been geared toward reaching out and giving hope to those in need. Darryl's renewed passion for life is best said in his foundation's mission statement, "The spikes are in a box, the bat is retired but the true passion and purpose for my life is just beginning. That passion is being able to make a difference in the lives of others. That's what life is all about." Ray Negron knows that he is blessed. In the spring of 1973, when Negron was 16, none other than George Steinbrenner, the Boss himself, caught the teenager tagging an "NY" logo on the outside of Yankee Stadium. Instead of pressing charges, the Boss gave Negron a job as a batboy. Negron has been around the game ever since. He was drafted in the second round by the Pirates in 1975 but couldn't hit enough to play pro ball so he returned to the Yankees where Billy Martin and Steinbrenner kept him busy. When Reggie Jackson arrived in '77, Negron became the superduperstar's personal assistant away from the park. "Reggie used to say that if he was the King of New York, then I was the Prince of the City," says Negron. Mr. Negron was the one person who was close with Reggie, Billy and George during the most volatile daysof the Bronx Zoo, making him a unique figure in Yankee history. After Jackson left New York, Negron tried his hand at acting, and later became a player agent, working first in Japan and then back in the States. He was the only minority GM in the short-lived Senior League in the late eighties. But he's perhaps most recognizable as an advisor to both Darryl Strawberry and Doc Gooden, the man who helped broker deals to bring the erstwhile Metropolitans to the Bronx in the mid-nineties. Mr. Negron's biological father was a physically abusive alcoholic, and his two younger brothers are addicts as well. Subsequently, he has specialized in drug counseling. Mr. Negron worked for John Hart in Cleveland and then Texas as a player liason--he was especially close with Roberto Alomar and Juan Gonzalez--before returning to the Yankees last year. Anthony Bergamo is well respected in New York City and throughout the country for his commitment to law enforcement, charity and for his broad business success. Mr. Bergamo is the Vice Chairman of MB Real Estate, a national full service company engaged in the leasing, sales, investment and management of commercial and industrial real estate. He also serves as Chief Executive Officer of Niagara Falls Redevelopment, LLC. He has been a Director of Dime Community Bancorp since 1986. Mr. Bergamo has been a Director for Lone Star Steakhouse & Saloon, Inc. since 2002. Mr. Bergamo previously served as Chief Operating Officer and Executive Vice President of Greyhound Exhibit Group and Greyhound Exposition Services, the world’s largest tradeshow and convention company, with over 3,000 employees. Mr. Bergamo also serves as Special Counsel for New York State Association of Chief of Police, Westchester Country Chiefs of Police Association, New York State Court Clerk Association, Columbia Association New York City Department of Corrections Inc, New York Organization of Narcotics Enforcers, New York City Department of Correction Asian Jade Society, Shomrim Society New York Police Department, Hispanic Association of New York Police Department, New York City Captain’s Association, Suffolk County Correction Officers Association, Guardian Association of New York Correction Department, The New Jersey State Association of Chiefs of Police, Bergen County Chief’s Association, Passaic County Sheriff, Columbia Association of New Jersey, Federal Agents New Jersey State P.B.A. Local 121, Las Vegas Metropolitan Police Managers and Supervisors Association, and Clarkstown Policemen’s Benevolent Association. Mr. Bergamo is Founder and Chairman of the Federal Law Enforcement Foundation. Established in 1988, this Foundation was originally formed to provide financial support to the families of law enforcement officers in time of tragedy. He has been recognized by FBI, NYPD, US Secret Service, US Customs Agency, DEA, US Attorney’s Office, US Dept. of Health and Human Services, US Marine Corps, Office of the Mayor of New York City, and many more. He earned a BS in history from Temple University, and a JD from New York Law School. He is admitted to the New York and New Jersey Federal Bars, US Court of Appeals and the US Supreme Court. A dedicated family man, he was born and raised in New York City and reside there with his wife and two children.